The United States conducts an immoral war in Iraq and slips into the family of nations that commit torture. Prisoners are held without due process; citizens are subject to warrantless surveillance; and the Administration holds itself above the law. It was only a matter of time before Americans would take to the streets. We want our consumer bill of rights! I hear you can plug-in a little flashlite accessory if you happen to lose your way. 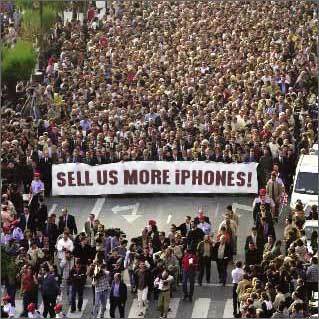 The rally for big screen TVs was even more impressive. Shiny, shiny, Mole. Lou Reed is my co-pilot.